Published April 14, 2011 By Anna T. This post may contain affiliate links. Regardless, I only recommend sites I've researched and/or used and trust. Pearson is a company that hires people to work from home scoring student assessment tests. They have been in existence for 50 years and are considered one of the leading companies to use for scoring by most academic institutions and educational professionals. How much can you earn as a Pearson scorer? Pearson scorers earn around $12 to $13 hourly. However, there are opportunities to make more. Pearson also has many projects available for people who are bilingual, and these typically pay more. It's additionally possible to earn slightly more money by working after 7 p.m. They pay with direct deposit. One thing to keep in mind about Pearson is that the work is project-based. This means that whether or not you make any money will depend on if they have a project available for you to do. Also, projects may last anywhere from two to as long as twelve weeks. It just varies. I would recommend looking at Pearson as a way to earn side income — not to pay your bills full-time. This is because you cannot depend on work to always be there. What are the requirements to be Pearson scorer? To qualify for Pearson employment, applicants must have at least a Bachelor's degree from a university or college located in the United States. They may also require a degree in the subject you are scoring. It's also necessary to have a stable phone and Internet connection as well as a quiet environment to work. 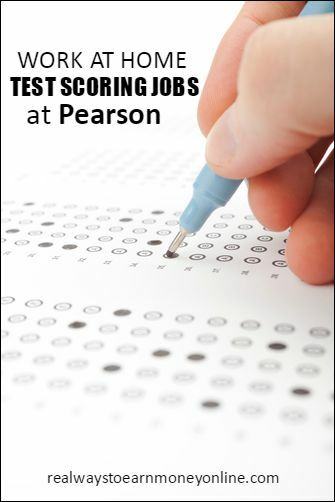 Pearson does hire people to work onsite in their scoring centers as well as online. Does Pearson hire people outside the United States? Pearson hires only U.S. citizens, resident aliens, and people who can work in the U.S. legally. How does the application process work to become a Pearson scorer? There's an application to fill out online as well as a survey to take so they can determine whether or not a person is a good candidate for the job. A trial scoring session must also be passed. After a person has been accepted, the training process begins. Everyone is paid for training, fortunately. Once hired, it's necessary to commit to at least 20 hours per week, but the times a person works are very flexible. There's no set time just as long as the 20 hour minimum is met. Does Pearson scoring at home offer benefits? Yes! They offer health insurance through America's HealthPlan Consultants that will cover not only the person working but also that person's entire family. This is unusual because most work from home jobs do not offer insurance. What do people say about working for Pearson scoring? It's a gig most people are happy with. Unfortunately, not everyone can do this because of the requirements for a college degree. If you have at least a Bachelor's degree and need to find something to do from home, this might be ideal! For a little insight into what current Pearson workers are thinking about the job, check Glassdoor. How do you apply to become a Pearson scorer? You can go here to apply for jobs at Pearson. Good luck! Looking for more work at home jobs in the education industry? If you're looking for other work at home jobs in the education field, you can browse FlexJobs for the latest listings. It's a membership-based paid site, but it's very reputable with well-researched listings that are guaranteed scam-free. I've had my membership for over a year, and I love it! If you decide to join, be sure to use promo code AFFILPROMO to get 30 percent off your membership. I just received my paycheck from Pearson; however, I don’t think they included my scoring incentive. Does anyone know how that is usually paid out (separate check, same check,…)? The first time I worked for them, I got two separate deposits. One for regular hours, one for bonuses. Since then, it’s all been in one. OK, maybe this is new for 2017 but you now have to work a minimum of 30 hrs per week!! Is it ok to work for Pearson and ETS at the same time? I am interested in scoring just math tests rather than reading or English. Does Pearson offer a lot of Math tests for scoring? Hi NAJWA. I guess to answer your question we will need to know your location. In some cities such as Austin they have lots of projects on site, throughout the year. In other cities they don’t have that many projects. Now, if you are talking about scoring from home, then I think you are making a mistake by only wanting math projects… I mean, the projects you can do from home are very few…. and if you only want math projects then the projects you will be called for will be very few… maybe 2 projects a year..
I’m curious to know if Pearson actually checks references since they ask for that information on the application. This would not be a problem but was just wondering if they actually do any kind of a background check on their applicants. Hi Patricia. What position did you apply for? scorer? if so, I don’t think they check for your references…Though, they want you to have a college degree, so that’s probably the only think they will check. That is, they will make sure that your college degree was earned at an accredited college. No, I don’t think it always is. No, it is not always open. I did not have a good experience with them, my colleague had the same experience with them. I was hired to score the middle school writing test in February, 2016. I trained, but did not pass. (I have scored many tests for ETS in the last four years and always pass so I know what I am doing) We both tried to reach out to Pearson many, many, many times, by email and phone to no avail. We were never able to reach representative personally, and we got a generic email that did address our issues about a week after we first contacted them. Unfortunately Pearson does not set the criteria for passing the training to score a project. Each project has a committee that sets the criteria (even if you don’t agree with it). I have scored for Pearson for 7 years and there have been two projects that I did not qualify to score; even with a Master’s in Education. There are also two projects that I was locked out of for scoring too fast. Even the rate and validity is set by the customer and not Pearson. Peak scoring normally starts in March. If there is a project, depending on the amount of people needed and your qualifications, you should hear something a few months. Its about a month or two months before the project starts. So, you have to apply every year??? You do not have to reapply each year. They keep your information on file. If you’ve scored well for them in the past, they will contact you when another opportunity opens up. I applied to them last year, and they said they were very interested in me, and I asked when would I hear back about a position, and they said it can take years before I’d possibly hear from them. Pearson is a real company…I’m shocked most people haven’t heard of them. We have all went to college…and the company produces some of those textbooks. I’ve worked for them since 2008…the job is not everyone since its not steady income and you have to take qualification tests to score. I wouldn’t worry about though, since they will put you on another assignment if that doesn’t work out. Each project is different. Some are very easy to score and some are very hard. I prefer to score Reading assessments–no brainers and much easier than writing assessments. The pay is fairly decent–$10.10 for training and 12.00 per hour once you start training. You do get a raise once you reach a certain milestone of hrs. Another thing, you do not have teaching credentials, or been a former educator…they only require a Bachelor’s degree. Some projects are degree specific…so make sure you stress your major. Give it a try and Apply. Great question Heather, I have been trying to find this information myself. Just completed a project and uncertain if I am eligible for re-hire or what that process looks like. From what I’ve understood, they will contact you when future projects become available. As long as we keep accepting projects and doing well with them, we should be contacted in the future. I hope. This is my first time scoring with pearson. I was told if you see the out of work message to call in and they will put you on another project. I have been out of work twice and called and I have been moved to another project very quickly. I do have a question for the seasoned vets though. How do you come back the next year to score? Do you have to reapply or do they contact you again? They will contact you year after year, no need to reapply. Lynda Turner, Thanks you for the tips on Oracle! I hear you all! Seems so hard to recover from a low validity agreement score when initially the validity checks are far and few in between. Then I hope for more validity checks (and am afraid of getting them). I find myself doing a ton of “Performance Peeks” then in hopes to gain more insight. In math I have found some of the calibration and validity guidelines differ from the anchor annotations. I’m happy to find this page and read the input from all of you. This is my first week scoring reading. I feel like a failure, low validity. I am using all resources but cannot seem to get it right!! It is so frustrating, because I am thrilled about the position. Anyone feeling the risk of losing their position? Also, I have been running into “out of work” messages, which will remain for hours. So I am under 20, but I also had no papers to score. Ugh, not feeling good after week one. I’m scoring math which seems like it would have to be easier than scoring essays. I do get nervous every time I hit “submit” because I never know if I’ll get the message that I didn’t score it correctly. It took me a while to get my validity up one time after I had a really wrong score, but I was able to bring it back up with time. I really like this job, but if I don’t get perfect scores, I feel like I won’t be asked back. The out of work things are annoying, but generally for me they’ve had something new up within a few hours. Keep checking back and if you don’t see something new, give them a call and ask. Kelly, I am right there with you. I keep cycling through green, yellow and red (though WAAAYYY more yellow and red) I have only been scoring for 2 days. I am so disappointed with myself. The anchors really don’t address all the crazy options that pop up, so I am trying to make good choices, but maybe I am not. GAH! Stacie, it says on the site you can get compensated for your time waiting on the phone. Anyone else know how the incentives are paid and what they look like in the pay statements? Also, anyone had time disappear from your work day? I take screenshots of my “Peek Performance” when I’m done for the day. There was an hour and a half missing in the Timesheet the next day. Also, I work almost 5 hours one day and didn’t work at all the next. On my timesheet a few days later it looked like one of the hours was moved from the previous day to the day I didn’t work. Anyone understand how they do this? How do we put in for the paid 15 minute breaks after working for 4 hours? TY! Two deposits were made directly to my bank…one was for my regular hours worked and one was for my bonuses. The time sheets don’t update until the following night, so sometimes the numbers don’t look correct until two days later. You can get a paid 15 minute break only if you work 4 hours straight without taking any breaks of your own in between. You can add that time yourself in your Oracle time sheet section. Go to the time sheet that needs to be updated and change the time for the day to include your break time. You need to add a note in the box as to why you are changing your time. Click recalculate and then save. I am in the same boat. I have been calling scoring support to get a little clarification. Maybe a few tips. I can’t get anyone on the phone to help me. I have been on the phone, on hold, for 2 hours over the last 2 days. I need to qualify, but am scared to do so until I get a little clarity. I am pretty sure I am going to bomb it at this point. Is anyone else having difficulty with their scoring percentage? I have scored 65 papers, and I was dismayed to discover that I only have a 50% agreement rate in the written expression component. I am surprised, because I have 26 years of teaching experience in this grade level, a masters degree, and I am a national board certified teacher. Can anyone help me figure this out? I would really like to keep this job. I can use the extra money! Thank you! Also, they only check some of your scoring. They only checked 11 of the ones I scored out of the 1100 I scored on one day. Hope that sort of helps. I am a 27-year veteran in ELA education and am losing my confidence in my abilities. No matter how much I read the anchors and study, I can’t get my written expression scores where they need to be. It is frustrating to take something so subjective and expect scorers to come up with the same scores when the information seems to contradict itself from one item to the next. I would be more comfortable with a checklist. I was sent a job offer from Pearson on 4/4/15. I accepted and was sent a Welcome email on 4/6/15 which outlined the tasks I would need to complete, the dates due for everything, and my login information for Onboard. I logged into Onboard and completed all of those tasks and mailed in my I-9. I cannot find the link for the training/qualification ANYWHERE and it is due Friday. I even emailed human resources but no response as of yet. Does any one have any ideas? It would be greatly appreciated. Thanks. You will have to get your employee ID number that came in the email that told us about training. If you can’t find that info, you will have to call the company. Unfortunately, the wait times have been huge with the start of the new scoring project. Maybe get on the phone as early as they open. The website has specific information about requirements. I have a biology degree but just started scoring Algebra I as I have a strong background in math and feel very comfortable with the subject. Completed my first day of scoring yesterday and hit all of my target percentages. My first day frustrations included the website being wonky and being down for a while, their computerized system not logging in my hours and items scored accurately, and there being long phone wait times for help. Hoping all of this will smooth out today. Keep track of your hours worked as you can adjust your time card if needed. I enjoyed my first day despite the first day challenges. Hi, what field does your degree have to be in ? What is the pay rate for training and for scoring? $10/hr for training and $12/hr for scoring (Math Level 3). Not sure if amount is different if scoring something else. Minimum is 20 hours a week, but can score up to 40 hours per week if you want. Positions are filled in the order employment paperwork is completed. If you submit forms that are incorrect or are not complete, you will not move forward in the hiring process until updated forms are received by our office. If you wait until the end of the window to complete all of the requirements, you may run the risk of not being able to work this project. I completed the paperwork, sent my I-9 and kept my fingers crossed I got it all in on time. About a week after that I got an email saying my file was complete and I would receive a welcome email with passwords and usernames. I finally received that email yesterday afternoon, training starts 4/20. It would have been nice if they hadn’t cut it soo close, but after reviewing what’s available there’s not really much do before the start date, it took about 30 minutes to click around the website and read what was available. My biggest concern was if there were certain hours I would have to do training, which there are not. I received an offer in February to begin scoring on April 20. I completed all the requirements six weeks ago and received an email on March 8 stating my file was complete, and that I would be getting a welcome email prior to my training. It is two days prior and still no email. I have emailed two different email addresses to find out when I can expect it but received no responses. I will try to call as well, but I’m starting to get worried, especially after reading the post above from Disgruntled. Update: I did receive my welcome email last night. Very disappointed. Finally got an offer 2 weeks ago (I applied in 2013), clicked accept and went through the steps. I never got any confirmation that my acceptance went through, so I called the next day to confirm. They said I should have gotten an email with the info for onboarding. I hadn’t (never did), so they gave me the info over the phone. I completed all the tasks, even got a notary for the I-9. Got an email this Monday saying my file was complete, and I would soon be getting my welcome email. I called today to check on the status, and after 30 min on hold, I was told they were just backed up and I’d be getting the email soon and an extension for training. A couple hours later, I got an email saying all scoring positions have been filled for this project, but they’ll email me if they find another project. HUH? So I called and the person was not very apologetic, said there was nothing they could do and that all offers are “mass emailed” and it’s first come first served. Then WHY not state that in the initial email, and why let people go for 2 weeks thinking they have a guaranteed job? Anyone else share this experience? Those of you that have done scoring work for Pearson in the past, could you explain the scheduling that is mentioned in the welcome email? Do I have to set a certain schedule and adhere to it, or can I score whenever I have time, as long as I complete the set number of hours? It’s impossible to know whether I can do this job while caring for my children without knowing the details of scheduling. Being able to score whenever I have time will be ideal, but a certain set schedule that must be followed will be difficult. Thanks for you time! In my experience, you schedule yourself a certain number of hours per day, but not the exact times. It could be different depending on the exam being scored, though. Personally I can only do this job while my son is being cared for by my husband or mom, because you need to be able to concentrate. I’ve been scoring for Pearson for a long time and it has been a great opportunity. I applied a year ago and also just heard this week. My biggest question is it says work schedule Mon-Fri, but then elswhere in the email it says their workweek goes Sat-Friday. Does this mean I have to log all 20 hours in during Mon-Fri? I am hoping it means that is just when the students take the test. I am very interested and would love money to supplement my current teaching salary. I just applied. I will let you know when I hear back from them so we can get an accurate idea of how long it takes for them to respond. I also applied for a position as an at-home scorer about one year ago (2014) and heard from them this year 2015 (new scoring season I suspect). Interestingly enough, I heard from both Pearson and ETS within a couple of weeks of each other. Trying to decide which is the best option for me. I recently went to the Pearson website to complete an application. At the site I was asked to create credentials, which I did. What usually happens next? I completed an application for Pearson a while ago because I was interested in being a at home scorer, but I’ve never received a reply. I’m still very much interested. Thanks! I applied nearly a year ago and I just got a response this week. I guess you just have to wait. I recently completed scoring at the Virginia Beach, VA site and understand there may be at home opportunities for the TEXAS project. I have successfully scored and would like to work at home on this project. Is there a way to contact Pearsons for a bit more info on the scoring at home jobs. It would be nice to have some basic questions answered before applying. I have scored for PEarson as an at-home scorer since 2009. Great company, very flexible to work with especiall if you have kids at home. Not for everyone – especialy if you need consistent year-round income but since you can work whenever (typically anytime between 7 am – 11 pm central time) it is easy to work around another job. They get high reviews from me! I’ve worked for Pearson on and off for over 10 years. They are a large company and one of the major players in school testing. I started out working for them at one of the local testing centers on site. I started working for home for them a few years back. The work only last a few weeks during the scoring periods so it only a little extra money but pay can increase once you’ve been with them a while and have good production. Although I’ve been with them for years I had to send in notarized paperwork when I started at home work and once again a year ago. It actually gives you an idea of just how legitimate they are. You are an employee when you are working, not a contract worker so they need proof of eligibility to work. Most at home work is contract. You hours build up over the years you work for them if it is only a couple of weeks which, again affects your pay. If there is a scoring center in your state located nearby it would be good to work on site if you get a chance to help with understanding the work better. I just applied, literally! I was asked if I was interested in a supervisory role as well. I am uncertain whether that is general protocol. I will re-post as things progress. Pearson is a real company. I work for them now in their scoring center in mesa, az and have driven by their huge production and scoring center in iowa city, iowa thousands of times. They require bachelors degrees and verify them through a third party. I signed up for Pearson Scoring but because I’m working from home they asked me to send in notarized paperwork to prove I’m authorized to work in the USA. When I went in the notary commented that they ask for a lot of personal information (copies of my passport). Now I’m worried about the legitimacy of the company. Can anyone help alleviate my fears? I haven’t done work for them, but several others have and they are legitimate as far as I know. You can do a search for Pearson on WAHM.com or the Work Place Like Home forum and find several threads where people are talking about working for them. Still, if you don’t feel comfortable applying or giving out certain info they’re asking for, you might want to contact them and explain your concerns. Thank you Amy! I didn’t get a chance to apply for the home scorers, but hopefully they’ll open up again in the future. I have been scoring for Pearson during the spring state standardized testing season for 6 years now, 2012 will be my 7th year and I enjoy it. I’m able to work from home. Altogether it’s only about 6 weeks between the two projects that I normally work on, but that’s 6 weeks worth of pay more than I had before! The hours are very flexible. You can grade early morning to late at night, there are hours on the weekend as well. It’s worked out nicely for me to be able to grade around the schedule of our little ones. Thanks for your input Amy! I’m glad to hear that you enjoy the work and the flexibility. Do you know if work experience will qualify as a degree they are seeking? Oh and I am so Happy to find YOU! Great information and such a detailed site for the work at home crowd!!! I am not sure if it would qualify, but you could always apply and note your work experience on your resume. Definitely worth a try! Good luck!! You MUST have a 4-year Bachelor’s Degree and must be able to provide proof. All of the scoring projects require that you have a Bachelor’s degree. to become a scorer and they prefer that you have teaching experience.